Louisville, KY (October 2, 2012) – The season for roadside farm markets is far from over, but Kentucky Farm Bureau wants to help market owners get next year’s efforts off to a great start – enrollment for the 2013 Certified Roadside Farm Market program is now open. 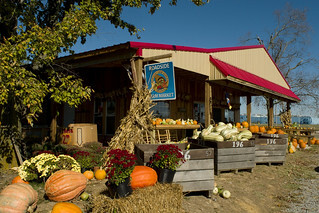 Enrollment to be a Kentucky Farm Bureau Certified Roadside Farm Market is now open. Established in July 1996, the Kentucky Farm Bureau Certified Roadside Farm Market program began as an initiative to help farmers market their fruits and vegetables directly from roadside markets to consumers across the Commonwealth. Since then, the membership has expanded to include farm enterprises like greenhouses, landscape nurseries, Christmas tree farms, vineyards/wineries and meat/cheese farm markets. Markets certified through this program are identified by the cornucopia logo and listed in the Certified Roadside Farm Market Directory. The program also provides collective advertising, promotional items, education tour opportunities, and other marketing benefits with the intent to increase the net farm income of member markets. Early enrollment for the program is October 1-November 15 and is $235 per market. Regular enrollment is November 16-December 31 and is $310 per market. Enrollment applications must be postmarked by December 31 to guarantee a spot in the annual Membership Directory. Applications for membership are available on the Kentucky Farm Bureau web site, kyfb.com/roadside. For questions about enrollment and benefits of the Kentucky Farm Bureau Certified Roadside Farm Market program, please contact Kara Keeton, Director of Commodity Marketing, at (502) 495-5106 or by e-mail at kara.keeton@kyfb.com. “Like” KFB’s Certified Roadside Market program on Facebook at facebook.com/KYRoadsideFarmMarkets or explore the program’s full photo gallery on Flickr.